You buy the official activation key for the game Arma 2 Operation Arrow. After the first purchase, you receive a discount for all subsequent purchases of all our products. The key you get immediately after the payment in the window that opens after the payment, as well as a link to the page with the key will come to your mail indicated when purchasing. *ATTENTION! (Instructions on the exact installation of DAYZ mod on Steam are on the fan sites of the game). All actions related to the installation / configuration of the mod DAYZ - You do at your own risk, we just guarantee that you bought our license key "Arma 2 Operation Arrow" for activation on Steam. In Arma II 2: Operation Arrow, three years after the events of the original game that took place in Chernorussia, a new hot spot appeared in the region of Zelenomorskoe: this time an armed conflict broke out in Takistan. A limited contingent of the US and NATO forces is sent to the Central Asian republic, swept by the war, in order to quickly restore order and prevent further casualties among civilians. 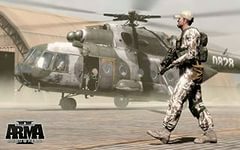 Game Arma II 2: Operation The arrow is a simulator of military operations as close to reality as possible, in which players will be able to fight in different types of troops - from infantry and armored to spetsnaz and aviation. In ArmA II 2: Operation Arrow has taken into account every detail, including the trajectory of the bullet's flight under various conditions and features of damage to various materials. A unique carefully designed combat system is designed specifically for large-scale battles.